Want to know how to repair a refrigerator? You have come to the right place. While different models have different designs and different controls, refrigerators work basically the same. So that there is no confusion this page will talk about single evaporator models only. Single evaporators divert cold air from the freezer into the fresh food section to control temperature. Dual evaporator refrigerators have a separate refrigeration system in the fresh food section to control temperature. Again, this page only talks about single evaporator refrigerators because they are more common. The first thing you want to take note of is if the refrigerator is cooling any at all or is it completely off. If a refrigerator is not cooling at all, you first need to figure out the state of the compressor. Check to see if the compressor is running or not. If the compressor is not running, check to see if the compressor is hot to the touch. If the compressor is hot it may be off because it overheated which will happen if the fan next to the compressor isn’t running. 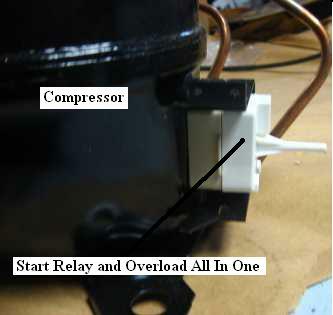 In which case, the compressor is bad or the compressor start relay is bad. First, check to see if the fan is running. If it is not, wait until the compressor tries to start and it will do so once it cools off. When the compressor starts, see if the fan comes on and if not the fan is most likely bad. Unplug the refrigerator and spin the fan by hand. Then wait 10 minutes and plug the refrigerator back in. When the compressor tries to start, see if the fan runs and if so replace the fan. Note: do not try spinning the fan by hand when you first discover the fan is off; wait until the compressor tries to start. Doing so my result in a false diagnoses. If the fan is running but the compressor will only stay on for a few seconds, the start relay on the compressor is mostly likely bad. 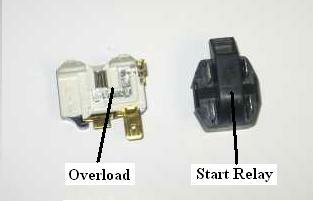 Unplug the refrigerator and remove the start relay off the side of the compressor. Shake the relay and if it rattles like a baby rattle, replace it. If it doesn’t rattle, you can try replacing it to see what happens. If replacing the relay doesn’t fix your problem the compressor is bad. This section will tell you how to repair a refrigerator that is not cooling at all but the compressor is running. First, see if the fan in the freezer is running and if not remove the back cover out the freezer to check the fan. Check to see if the fan is stuck by attempting to turn it by hand. If it frees up and starts running, replace the fan. If it spins freely but won’t turn on its own, it is most likely bad but you will have to test voltage at the fan to be sure. If the fan is running, remove the back wall of the freezer and check to see what the frost line looks like. The frost line is the line of frost on the freezer coils. If the refrigerator is working correctly, there will be a thin layer of frost along the entire coils. If there is heavy frost on only part of the coils, you have a sealed system problem in which case you need to call a professional or replace the refrigerator. 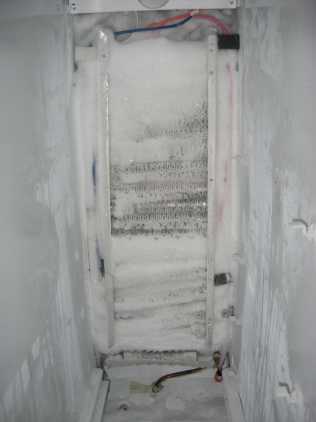 If there is heavy frost from top to bottom like the picture below you have a defrost problem. For more on this visit Defrost Problem. If your refrigerator is cooling some but not enough, there are a few things to look at before you turn a screw. Check to see if the fan in the freezer is running. Check to see if the fan near the compressor is running. Look at the back wall of the freezer to see if there is heavy frost present. Check to see if the condenser needs cleaning. If the fan in the freezer isn’t running, remove the back cover out of the freezer to check the fan. Check to see if the fan is stuck by attempting to turn it by hand. If it frees up and starts running, replace the fan. If it spins freely but won’t turn on its own, it is most likely bad but you will have to test voltage at the fan to be sure. If the fan under the bottom isn’t running refer to the section above titled compressor not running and read about the fan not running. If the frost is heavy on part of the coils and none on the rest, you have a sealed system problem in which case you should call a professional or replace the refrigerator. If you see a light thin layer of frost (that does not block airflow) your problem is elsewhere. Look under the refrigerator and find the coils. Check to see if theses coils are dirty and if so clean them. This may fix your problem because if the coils are dirty enough it will cause the compressor to short cycle meaning it won’t run long enough to cool your refrigerator.